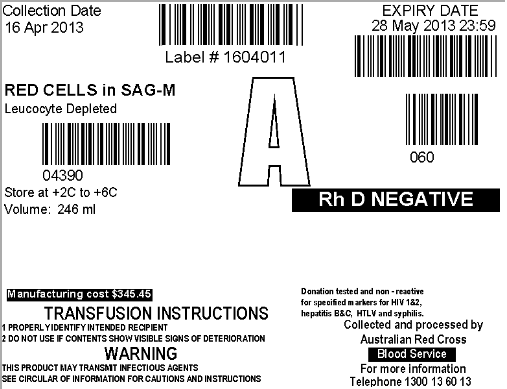 As part of the Wastage Reduction Strategy from May 2013 blood components supplied by the Australian Red Cross Blood Service included a cost indicator printed on the blood bag label. Effective 6 July 2014, the cost indicator will be updated to reflect the 2014-15 costs. However, due to timing of stock run outs, the cost indicator may be different to the price recorded on BloodNet. The aim of this NBA initiative is to increase health provider awareness and appreciation of the costs associated with the provision of blood and blood products within Australia. It also supports awareness that blood is a precious resource given generously by donors. It should be used and managed with care. Whilst blood donation is voluntary, the collection, processing, testing and distribution of blood and blood products incur significant costs. The cost that is printed on each blood component label is indicative of the costs for that component type. FIGURE: Example of a Red Cell Component Label with Cost Indicator for 2013-14. It is important to note that patients will still not be charged for the blood that they receive, whether treated in the public or private sector. If you have any queries regarding this initiative, please contact the National Blood Authority on 13 000 BLOOD (13 000 25663) or inventory.management@blood.gov.au. Blood donors give their blood for free. Why is there a cost printed on blood bag labels? Are you charging for blood? There is no charge to patients for the bag of blood generously donated by blood donors. The inclusion of the indicative manufacturing cost printed on the label is to increase health provider awareness and appreciation of the costs associated with the provision of blood and blood products within Australia. It also supports awareness that blood is a precious resource given generously by donors. It should be used and managed with care. 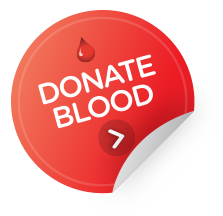 While blood is donated, there are costs associated with the Australian Red Cross Blood Service collecting, testing, processing and distributing the blood which helps ensure the safety and quality of the blood products made from each donation. These costs are fully covered by state and federal governments, which is why patients do not pay for the blood supplied by the Blood Service. There is no cost to the patient regardless of where they are treated. Why are you putting a cost on the bag of blood? The National Blood Authority has asked the Blood Service to put the cost on each bag of blood to make more people aware that it does cost money to provide blood to patients, even though it is donated. It supports awareness that blood is a precious resource given generously by donors. It should be used and managed with care. Is a lot of blood wasted? Some blood and blood products have short shelf lives and the maintenance of storage specifications is important to ensuring the quality of the product. A certain level of discards of blood and blood products, particularly fresh blood products with short expiry dates, is both inevitable and appropriate to ensure that products are available where and when they are clinically needed. However, there is a proportion of discards of blood and blood products that is neither inevitable nor appropriate. The NBA is working with health providers to minimise wastage of this precious resource. Are you planning to charge patients for blood? No, definitely not. The National Blood Authority has asked the Blood Service to put the cost on each bag of blood to make people aware that it does cost money to provide blood to hospitals. Patients are not charged for the blood in public hospitals or private hospitals, and there are no plans to change this. Will patients still get all the blood they need? The inclusion of the indicative manufacturing cost printed on the label is to increase health provider awareness and appreciation of the costs associated with the provision of blood and blood products within Australia. As a patient, you will still get all the blood you need. Doctors will order what their patients require.